Gate is a critical flow channel in mold injection system, despite of the direct sprue gate type, mostly the gate are the smallest cross-sectional area in the injection system, it is usually only 3% to 9% percentage of channel cross-sectional area. Large cross-sectional area of the gate can reduce the flow resistance and improve the melt flow rate, which is benefit the filling process and quality of molded parts. Better mold flow benefit the filling process, it's highly recommended to use in thin-walled parts and molded parts with fine pattern. If the gate size is large, then the packing time will last till gate is cool down and solidified, internal pressure is created near the gate, it is possible to cause deformation. If we use small gate, it is possible to adjust the gate volume by modification and mold trial, ensure the melt solidified in a timely manner at the gate packing process, control of feeding time properly to avoid the failure. 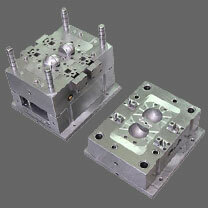 It is solidified quick because of small volume of the small gate, during production, it does not have to wait till the part cool down completely, parts can be released as long as the outer layer is solidified with sufficient strength and rigidity, thereby reducing the molding cycle, improve production efficiency. If a larger gate molded parts has high surface quality requirements, the appropriate tools often required and additional work needed to clean the gate scar left, particularly when the gate is too large, it would be much work load. This trouble can be avoid if using a small gate, For example, the small gate bar can be quickly removed by hand, or use a special injection mold structure to remove it at the time of releasing automatically. In addition, the scar left is small, generally it just need a little repair work to do polish.